Remember when I took the girls shopping in Kitchener a while back? I sat in the food court for about four hours that day... Well, I did do a lot of doodling that day and came up with a few ideas for more quilts. The next project will be a boys baby quilt with puppies! Here is a sample pup. Here is a peek at some fresh fabric choices for this project. I have some other fabrics to go with this pile... But I am wondering about the puppies... They are going to be appliqued onto four main blocks. Should I use these fabrics and make colourful dogs or should I choose browns, beiges, greys, black and white for the puppies? What do you think? Sew Fresh Quilts - Enchantment - finished! Introducing the completed Enchantment quilt and pillow set. Quilt is a twin size - 80" x 60"
I love how the pillows turned out! The matching pillow is a 20" square and the coordinating pillow is 8" x 16". Each has a hidden zipper closure and was quilted in the same flower and leaf design used on the quilt. The grey and white polka dot binding is a cross grain, double fold binding, machine sewn to the front and hand stitched to the back. I apologize for the quality of the photos... It was already dark when I finished the binding tonight, but I could not wait to get this in a post! Tuesday became my Monday this week. The kids were kept out of school Monday due to the weather. I gave them each a couple of chores to do. Which they did. And that must have worked because I didn't hear the dreaded "I'm bored!" all day!!!!! I worked on the two pillows for the Enchantment quilt set. One is a 20" square pillow, matching the quilt by using some leftover blocks and the other is a cylindrical pillow, 8" x 16", made in the feature fabric. Both have hidden zippered closures. They are looking good! I also got the backing ready for the quilt. I used two lengths of the fabrics from the top, one is the focus fabric, the other an orange. I then layered and pin basted the quilt. Today, I set to work free motion quilting the pinwheel quilt! I am always nervous when beginning free motion quilting on a large project. But I had practiced my design the day before, when I made the two quilted pillows. So I said a little prayer and relaxed. It is coming along beautifully! So close to finishing.... But it was bed time for the kids, so I had to give it a rest. I have used white thread for the whole process; piecing and quilting. Went through a lot of thread doing the quilting! I have had the binding picked out since the beginning of the project. And am looking forward to getting it applied to the front by machine and hand sewn to the back. I just love look of the hand detail. Best of all....... I will be using the second of my Sew Fresh Quilts labels from Spoonflower! Can't wait to share this project when it's completely finished!!!!!! 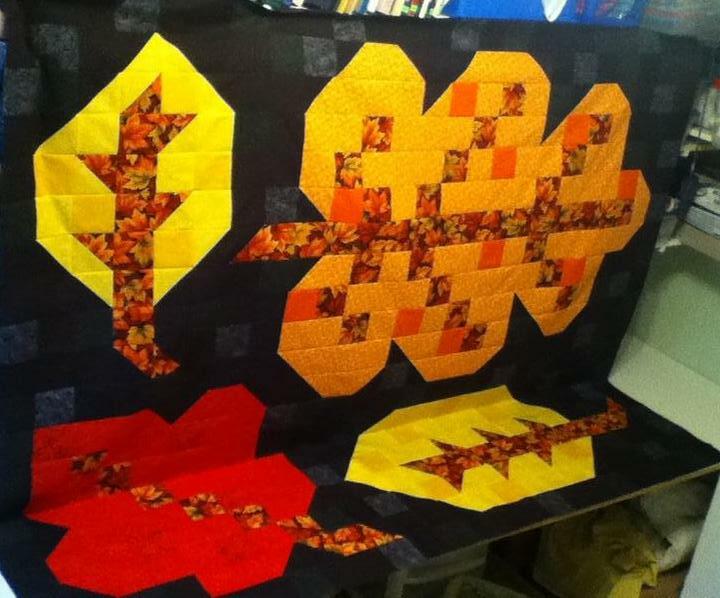 The Fall Leaves quilt top has been layered, basted, quilted and bound... I used the fall leaves print for the backing and for the binding. Binding... I tried the machine stitched on the back method by stitching in the ditch on the front. It is a little quicker than hand stitching, but I am not as happy with the look and will be reluctant to try it again soon, but I still have hope in mastering it. I took the quilt out to get some pics using my daughter's ipod. Could not see a thing on the display! And I think the direct sunlight was TOO bright. So I will try getting some better pics this week. 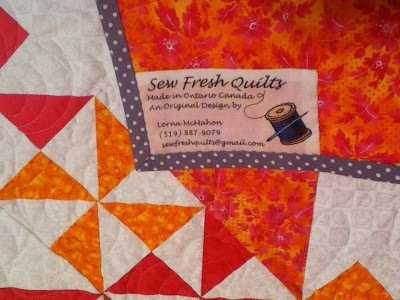 Here is a pic of the quilting, close up. Black thread was used for the whole quilt - piecing, quilting and binding. And it is the first quilt that I made using my Spoonflower quilt labels! I also decided on the backing for the Enchantment pinwheel quilt and it is ready for layering. I was really on a roll because I also have a matching pillow ready to be quilted. I am going to attempt a free motion design, so the pillow will be my practice piece. Meanwhile, our computer was in for repair. The USB ports were not working and I could not upload any photos. It took them two full days to get at it and get it back to us. So I did a LOT of housework and will have no guilty conscience to contend with come Monday. Glorious Monday... When the house is quiet, empty and quilty. Hey, I do love them, but relish the time alone quilting! What is your favourite time to quilt, sew or craft? It has now been a month since I began this blog. And what a fast, fabric-filled month it has been. I am sew happy. I really enjoy writing this blog, meeting new people and learning more about communicating on the internet, learning more about quilting, and now being able to do all this without having to wait for pages to load! I have been giving some serious thought to opening an Etsy shop. I mean I would love to be able to give away or keep all the quilts I make, but that would not be very practical. And I would never be able to keep making more and more quilts that way. There are so many ideas floating around in my head. So many things I would like to make - new techniques I would like to try. I certainly can't afford to just keep buying more and more fabric forever. But that sure does sound like a fun thing to do! So I have been looking at Etsy shops online. And I began the basic steps for opening a shop, but need to make a few things to fill the store before I have the official Grand Opening. Selling the patterns for these items also appeals to me. I have been working on making patterns and instructions for the two quilts I am working on right now - the Enchantment pinwheel quilt and the Fall Leaves quilt. I think I should include too much information rather than not enough information. I guess it is what I would want if I was to buy a pattern. You can always skip over and ignore anything you already know. And if I give instructions on how to do something and someone reading it already has their own method that works for them - then they can do it their way. Have you bought any quilt patterns? Do you wish there was more information given? Who ever came up with that "Quilt as desired" anyways? Have you ever written a quilt pattern? Well, Sunday did not turn out to be as productive as I had anticipated. I was awoke at 4:30 in the morning because of the high winds, so I got up and did the dishes. To get them out of the way. I hate doing the dishes. After church, I made everyone lunch. Then I was tired. So I had a short nap. I did get a few rows sewed together later on. And then I worked on it all day Monday and got all the rows together. But not without a little un-sewing... I hate un-sewing almost as much as dishes. The funny thing about it is that I had written up a pattern in anticipation of selling it. And as I was sewing the rows together, I would notice that I had a block in the wrong order or turned around the wrong way. It was during my un-sewing that I recalled giving the instruction to check for such mistakes before sewing the rows together. I never listen... not even to myself. But the top is completed. And I have the backing ready, too. Sew, today I had anticipated getting it all pinned up and ready to quilt, but the 'snow day' put a kibosh on that, as I mentioned in the Button post. Better luck tomorrow... I hope. I have spent the whole morning ignoring my dirty dishes and trying to get working buttons on this blog. I found some nice little buttons on this Dan and Noah site. Sew it seams.... they are all working, except the Twitter one. That's appropriate. So I thought I would do a test blog post to see if that will help. HELP! Addition: Got the Twitter button working! Helped my husband get the snow blower hooked up to the tractor. Got the kids to help do the dishes. And went to the public library and the grocery store. Good day, but, sadly, no sewing... Love that hubby and those kids, but sure hope tomorrow is not a snow day. I went to Stratford on Thursday and retrieved my beloved Janome. He passed his physical with flying colours! While I was there, I seen some of his newer, bigger, (much more expensive) cousins. There were some real beauties there. But I am happy with my Janome.... For now. I also did a little fabric shopping while I was in town. My son now refers to me as a fabric junkie! I am not ashamed! We set to work first thing on Friday morning. 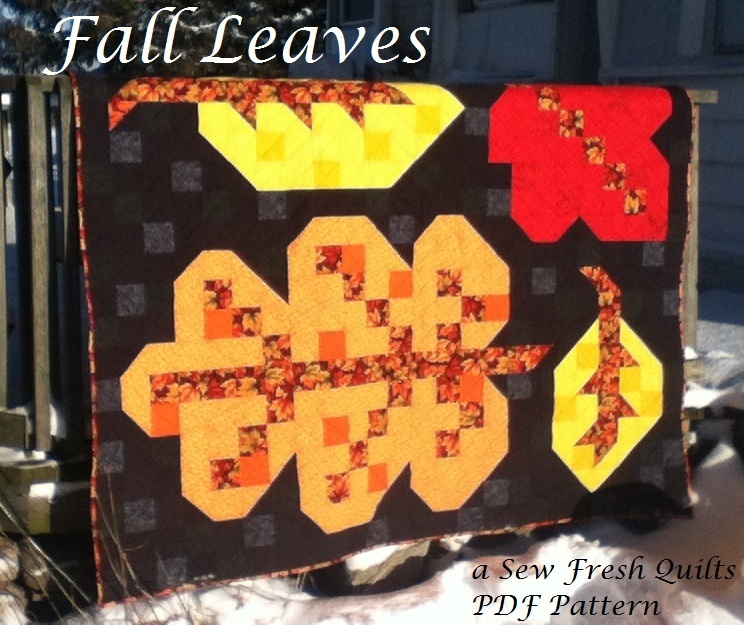 I designed a 'pixel' quilt in 3" squares to make a Fall Leaves couch quilt. So now it is Saturday, supper time, and I have completed 17 of the 20 rows to make the quilt. I know... I know... I really should have started working on the backing for the Enchantment pinwheel quilt, but I am not yet sure what I am going to do for the backing. Whole cloth.... Pieced.... And what colour??? Sew, I figured starting something new would give me time to think about it. Tomorrow, straight after church, I will be back at the Fall Leaves quilt. And complete the top. Do you feel like you have to finish a quilt before starting on something new? Do you find you lose interest in finishing a quilt if you don't? Today, our third site survey resulted in success. We are wireless and have wi-fi. My daughter is in her ipod glory. And my son is eagerly awaiting the purchase of a wireless adapter for his Xbox 360 so he can finally game online. Check off item number one on my list of New Year's Resolutions! Guess who's getting help with the dishes? I love my Janome. What a great friend to have! Such good times! 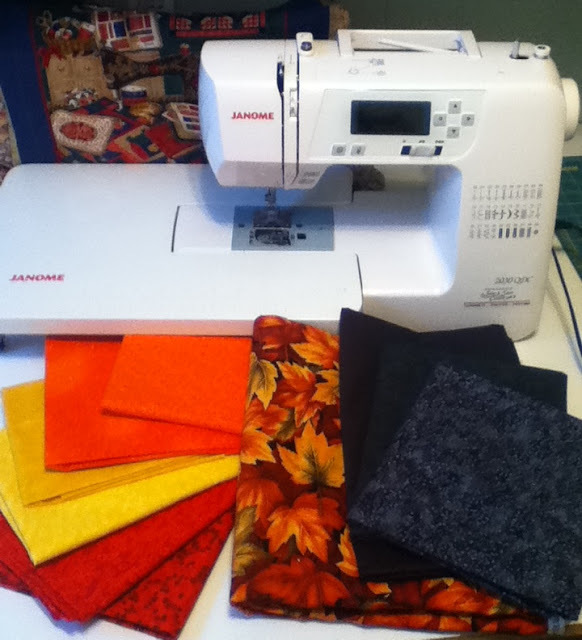 Janome has been with me since we met at the Sew and Save in Stratford, Ontario, Canada one year ago this past Saturday. We’ve been through a lot together since then. Mostly a lot of fabric. The mending pile rarely gets a second glance since Janome came into my life. To be honest, I am truly afraid that some of the items from that pile may hurt my Janome. I mean, it’s not that I think that Janome is fragile or anything.... He’s a sturdy little guy.... But I just don’t want to take any chances! I don’t know what I’d do without him! I used to spend a lot more time with my LG... It wasn’t always easy to get a turn though. Being on dial-up means that only one person can access the cyber world at a time from my home. And I do have a 13 year old daughter under the same roof. She has been so much more Facebookier since Janome moved in. Sadly, now that it has been a year, I will have to part ways with Janome – only temporarily – I hope! It’s time for his checkup.... I don’t know how I will fill my time while we’re apart. Perhaps neglected housework will be something to fill my time while he is gone? Spend some time staring at that ol’ television? Read a book? Write a book? Well, aside from taking on some of the housework chores, I’ll likely be drawing and doodling – trying to come up with some new ideas for when Janome returns. It won’t be easy looking at that empty space on the worktable. Chin up now, Lorna! You can do this. We’ll get through it! Keep your eye on the fabric totes. How do you cope with separation anxiety? Pictures! They are not the greatest, but .... I will try some outdoor photography this weekend. The snow is almost all melted already. A park setting would be nice. There are actually two pillows, but I did not make the back for the other one yet. I need another zipper. This was my first attempt at making a quilted pillow. Surprisingly, it turned out fine! This is the back of the quilt. Or not... Love the Kona solids! I ditch quilted between the white and grey and around each coloured square. Then I quilted a wonky star in each. 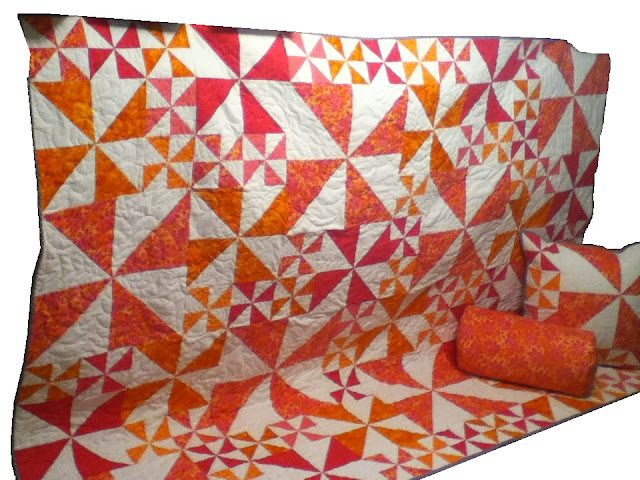 I really have to thank Rita Hodge of +Red Pepper Quilts for inspiring the binding choice. She makes her quilts with a flattering black and white stripe. Without her example, I would not have been brave enough to try something with a black background for such a white and bright quilt! This is the front. I used a polyester batting. The kids are out of school tomorrow - again - already.... 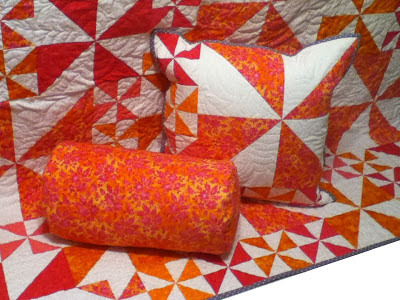 So, if I get any quilt making done - I may be starting on the backing for the pinwheel quilt. Good news.... My label fabric I ordered from Spoonflower arrived yesterday! So I would like to make this backing with one pieced in. Chain Linked - Eye Candy! Glorious Monday! Never thought I'd ever be fond of Monday's, but the kids are back in school - and although I love them - sometimes its nice to have a quiet house and to be alone with Janome. And although there are dirty dishes on my counter, Janome and I made good progress. I got the "Chain Linked" quilt basted and quilted today! Can't wait until tomorrow to apply the binding. Tried to take a few pictures while it was getting basted, but my daughter had changed the password on her ipod, so pictures tomorrow. Enchantment Quilt Top - Finished! I spent the day working on the backing for a different quilt. This quilt is 60" wide by 72" long and is what I call 'couch quilt' size. I also made two quilted pillows to match. A while back, I was googling around looking at quilt images when I seen a quilt designed by +Amy Smart called "Chain Linked". I loved the pattern she designed so much that I knew I would have to make one! You can find Amy's Pattern Shop on Etsy. I used white and grey for the background pieces. And bright colors - Hot Pink, Yellow, Green, Orange, and a Turquoise Blue - for the centers of the squares. The backing is made with a strip of four squares in grey with white sashing between, is topped with a Kona solid Green and under the strip is a narrower piece of Kona solid Blue. I will wait until the kids are back in school and the Dad is at work before I attempt to get that quilt basted and quilted. Once again, I will have to borrow the ol' ipod and take some pictures when it is a nice day out. I think the nice day will be sometime this week.... Already described as the day the kids are back in school and the Dad is gone to work. New Year's Resolution update - Two internet service providers have completed site surveys and neither of them can get a signal from their towers. One more to go... Got your fingers crossed for me? Please say a little prayer.